Let’s learn the basics of microservices and microservices architectures. We will also start looking at a basic implementation of a microservice with Spring Boot. We will create a couple of microservices and get them to talk to each other using Eureka Naming Server and Ribbon for Client Side Load Balancing. This is part 3 of this series. In this part, we will focus on creating the Currency Conversion Microservice. How to create a microservice with Spring Boot? How to use RestTemplate to execute a REST Service? How to use Feign to execute a REST Service? What are the advantages of Feign over RestTemplate? Currency Conversion Service (CCS) can convert a bucket of currencies into another currency. It uses the Forex Service to get current currency exchange values. CCS is the Service Consumer. The request above is to find the value of 10000 EUR in INR. The totalCalculatedAmount is 750000 INR. The diagram below shows the communication between CCS and FS. Following screenshot shows the structure of the project we will create. 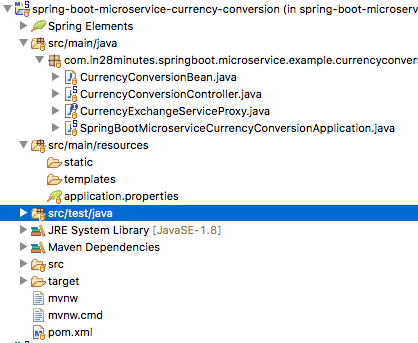 SpringBootMicroserviceCurrencyConversionApplication.java - The Spring Boot Application class generated with Spring Initializer. This class acts as the launching point for application. pom.xml - Contains all the dependencies needed to build this project. We will use Spring Boot Starter Web. CurrencyConversionBean.java - Bean to hold the response that we want to send out. CurrencyExchangeServiceProxy.java - This will be the Feign Proxy to call the Forex Service. CurrencyConversionController.java - Spring Rest Controller exposing the currency conversion service. This will use the CurrencyExchangeServiceProxy to call the Forex Service. Your favorite IDE. We use Eclipse. Creating a Microservice with Spring Initializr is a cake walk. Spring Initializr http://start.spring.io/ is great tool to bootstrap your Spring Boot projects. 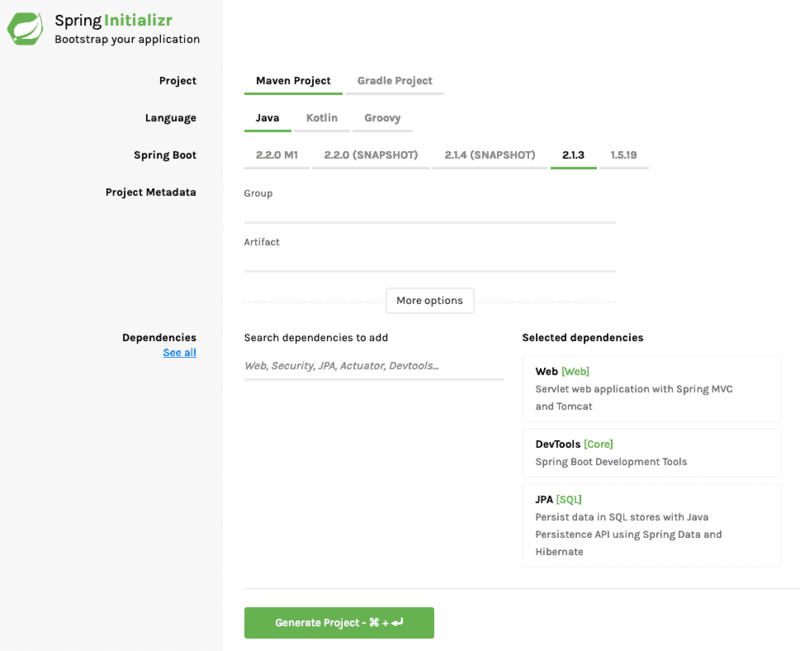 You can create a wide variety of projects using Spring Initializr. Import the project into Eclipse. File -> Import -> Existing Maven Project. This is a simple bean for creating the response. The code below shows the implementation of REST Client to call the forex service and process the response. As you can see there is a lot of code that needs to be written for making a simple service call. We are assigning an application name as well as a default port of 8100. Feign provide a better alternative to RestTemplate to call REST API. We first define a simple proxy. Making the call using the proxy is very simple. You can see it in action in the code below. All that we had to do was to autowire the proxy and use to call the method. Before we are able to use Feign, we need to enable it by using @EnableFeignClients annotation on the appropriate package where the client proxies are defined. We have now created two microservices and established communication between them. However, we are hardcoding the url for FS in CCS. That means when new instances of FS are launched up we have no way to distribute load between them. In the next part, we will enable client side load distribution using Ribbon.